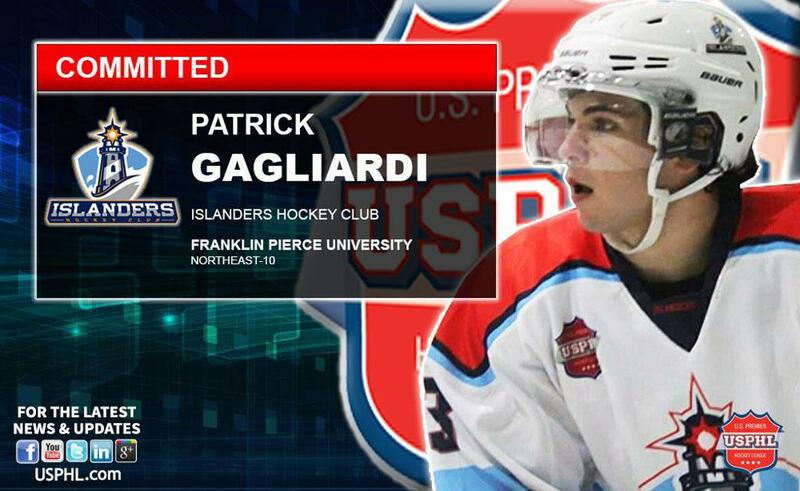 The Islanders Hockey Club would like to congratulate Patrick Gagliardi for his commitment to play his collegiate hockey at Franklin Pierce University which is located in Rindge, New Hampshire next fall. Gagliardi a 5 ft. 7 inch 165 lbs. defenseman has had a solid Jr. Season this year with the Islanders. He’s been our ”Steady Eddie” on the back line said Head Coach Tim Kyrkostas. “Pat competes his hardest each and every shift and he plays in every situation. He runs our PP and kills a ton of penalties for us. The kid is a warrior, I am just so happy for him and his family and I look forward to watching him play in school over the next 4 years.” Added Head Coach Kyrkostas. Gagliardi so far has 2 goals and 15 assists for 17 PTS in 29 Games for the Islanders. ”I am so excited to head off to play for Franklin Pierce next season and play for Coach Michals and Coach Millerick. They have big plans for the team and I am just happy that I am included in them.” added Gagliardi.